THE BRO CODE provides men with all the rules they need to know in order to become a "bro" and behave properly among other bros. THE BRO CODE has never been published before. Few know of its existence, and the code, until now, has been verbally communicated between those in the 'bro'. Containing approximately 150 "unspoken" rules, this code of conduct ranges from the simple (bros before hos) to the complex (the hot-to-crazy ratio, complete with bar graphs and charts). With helpful sidebros THE BRO CODE will help any ordinary guy become the best bro he can be. 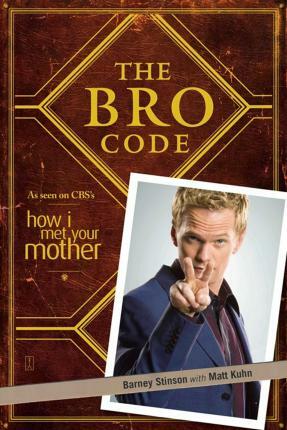 Let ultimate bro and co-author Barney Stinson and his book, THE BRO CODE share their wisdom, lest you be caught making eye contact in a devil's three-way (two dudes, duh.) Sample Articles from THE BRO CODE: Article 1: Regardless of veracity, a Bro never admits familiarity with a Broadway show or musical. Article 53: A Bro will, whenever possible, provide his Bro with prophylactic protection.Article 57: A Bro may not speculate on the expected Bro / chick ratio of a party or venue without first disclosing the present-time observed ratio. Barney Stinson works at a corporation, and regularly "suits up" to help his lovelorn and altogether pathetic bro Ted Mosby. Basically the coolest dude ever, Barney Stinson has been compared to the Fonz-but Barney is much, much more awesome. Stinson lives in New York, New York-and appears weekly on the hit CBS show "How I Met Your Mother" with his friends Ted, Robin, Lily and Marshall. Matt Kuhn is a staff writer for the CBS hit show "How I Met Your Mother" and helps write Barney's Blog on the show's website. He lives in Los Angeles, California.